When you're the smallest nation to ever compete on the world's biggest stage, how do you support your team on their first ever trip to the World Cup? You stick to your roots as a humble, friendly nation and invite the rest of the world to join your team. We launched #TeamIceland with an official invitation from the President and First Lady of Iceland, Guðni Th. Jóhannesson and Eliza Reid in their official home, Besastaðir. 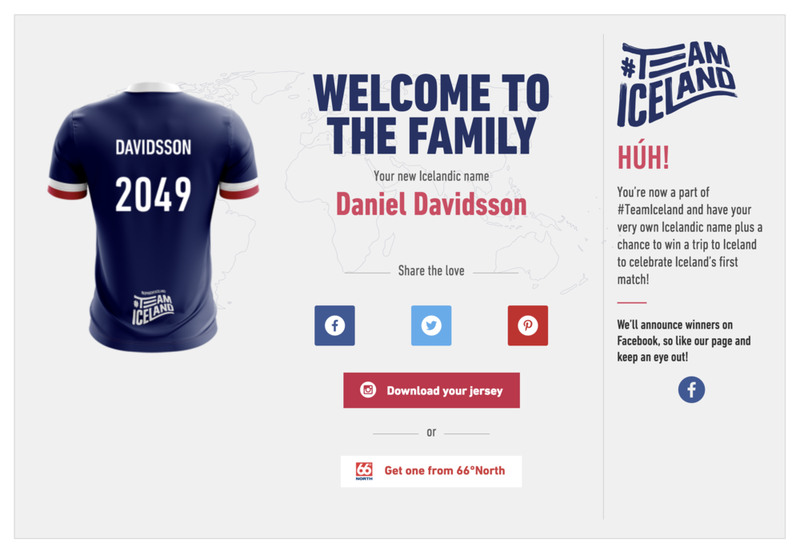 When someone joined #TeamIceland at teamiceland.com, they got a jersey with their Icelandic last name and their official #TeamIceland number. They could share their jersey on their social feeds or order customize a jersey from the 66° North Football Capsule Collection with their #TeamIceland last name. As the nation got ready for the World Cup, we released a social video featuring Icelanders of all stripes getting ready for the game, starring Icelandic comedians Steindi Jr and Anna Svava. For the United States, we poked fun at the overly contentious political climate. In Scotland, we made use of the rivalry between them and England. In Ireland, we apologized for the Vikings’ past transgressions when settling Iceland. And when inviting Italy, a nation already largely rooting for Iceland, we praised their far superior cuisine and ability to grow wine. And just before Iceland played their first-ever match against Argentina, we released a film showing Steindi teaching Argentinians everywhere to cheer for #TeamIceland, albeit under slightly dubious circumstances.